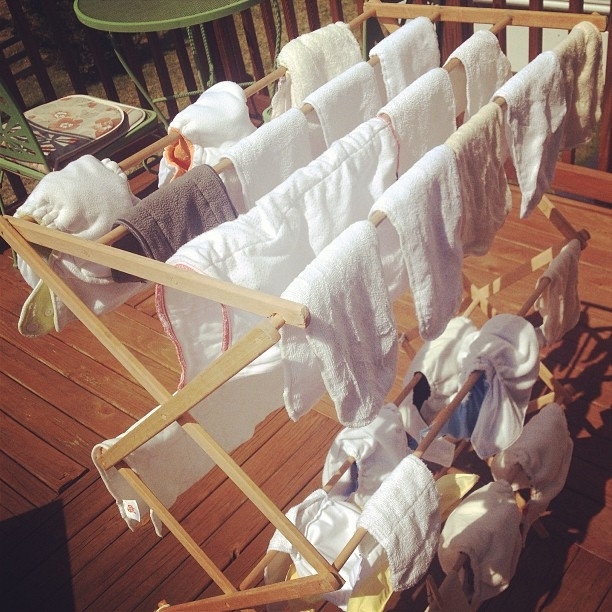 Posted on October 28, 2014 by Amanda Evans Posted in Cloth Diapering, Personal	. Being a mom is hard, no matter how you slice it. It is even harder when you don’t feel well. A story about cloth diapers and postpartum depression is an oddly difficult tale to tell, but, alas…it is my personal story. It is a tale I wish had been different, but can only accept and find solace in sharing with others. My transition to motherhood was a very rocky one. I’m fairly certain that it is not perfectly easy for any mom, although that illusion is often in place around us. It is a charade that led me to feel inferior since I did not gracefully become a mom. At all. I tripped, stumbled, and barely treaded water for over a year. My son and I struggled to connect, my husband had to take care of both of us, and my life was challenged in ways I never imagined. I felt like an abnormal, broken, tired, milk-machine. I was supposed to be a glowing, complete, happy, new mother. Clearly, something wasn’t right. Oh, the guilt I experienced for allowing my pain to completely overshadow the joy of our new baby. The shame I sensed for knowing things “could have been worse”. The selfishness I suffered that I couldn’t simply “snap out of it”. That’s the difference between baby blues and postpartum depression. PPD lingers and completely overwhelms. I felt like a stressed, lost, “surely this is a mistake” imposter. And it was not going away. I had no clue what to do with myself, let alone my new responsibility whom needed so much of me that I didn’t have to give. Deeper and deeper I drowned, so I sought help. I HAD to. Therapy proved invaluable to me and helped me deal with my postpartum depression, post-traumatic stress disorder, and many underlying issues that were triggered as a result (or perhaps were the real catalyst – who knows). As hard as it was, I am so grateful in hindsight that I’ve faced my “stuff” now and feel strong, clear, and peaceful for the future. I cannot credit therapy alone in my return to health and happiness though. There were a number of factors I reflect on as support, including mental and physical therapies, yoga, family/friends, nutritional changes, oils, prayer, and the biggest of all…time. But the one thing that gave me a focus to get through every single day in the meantime was cloth diapering. About 8 months old. Better and better. My husband and I figured when we would take the cloth route once we discovered we were expecting. We heard it would save us money and help the environment, and who doesn’t like those two ideas?! We knew nothing about diapers (of any kind) and didn’t know anyone who used cloth, so I took it to the internet. What I discovered was rather shocking. There were words I never encountered before as well as a massive amount of acronyms. What did AIO and PUL mean? Why were people “ISO NIP WAHM fitted for DS”? How is that even a sentence?! Cloth diapers have pockets and need “stripping”?? Boy, did I have a lot to learn! I let indecisiveness and doubt that I would/could stick with it keep me from starting a “stash” while pregnant. Then a postpartum phase riddled with complications is likely not the best time to take up diapers as a new hobby, but I continued to feel drawn to it. Instead of spending tear-filled days feeling like a failure, I made it my mission to get some diapers and just jump in. Immersion was the best way for me to explore this new world, much like learning a new language. I soon felt fluent in “fluff” through hands-on learning and returning to the internet as necessary. As with most things, it wasn’t as hard as my mind made it out to be. Cloth diapers were my “crutch”. When I became overwhelmed with constant nursing or flailing emotions, back online I went to look up more information (or buy more diapers). A vast community of other moms, both near and far, appeared easily at my fingertips. Strangers helped me build my stash, figure out laundry, and realize that others were simply navigating their way as a mom, too. Everyone cloth diapered in their own unique way. I was no longer alone in something. Drying outside. Gets the stink, stains, and sadness out. Public appearances in cloth diapers (my son, not me) generally became ice-breakers to get to know others. When a CDing mom meets somebody else whom CDs (I now understand why acronyms are so handy), they instantly become best friends! Sometimes other mothers would notice my son’s decorated tush and ask me questions about cloth. I considered it monumental when I realized there was a parenting topic that I felt confident to gush about. Cloth diapers provided me with a successful experience that I was able to manage as a mother. It gave me the clarity to strip life down to the basics and find the “simple” about each day. My mantra was, “Just feed and diaper the baby”. There were no dishes being washed or floors being cleaned for quite some time. I accepted that all I could muster was “getting by”, and that was enough. I nursed, slept when possible, changed those diapers, and washed them every three days. I never imagined a three-day wash cycle would provide so much guidance and excitement to my life, but it was a routine that made sense when nothing else was predictable. I seemed to latch on tightly to cloth diapering (and breastfeeding) simply because it helped me see that I was nurturing and bonding with my child. Whether one uses cloth diapers or not in no way defines a mother, of course. A woman is not a mother simply because she births a certain way, if at all. It doesn’t matter how she feeds, diapers, or puts her baby to sleep. She may do any combination of babywearing, pureeing, working…or none of these at all. A mother is a mommy because she does the best she can for her child(ren). It took me about a year to realize that I gave my all to my son, to the best of my ability, knowledge, and instinct. Perhaps I was a natural mother all along. 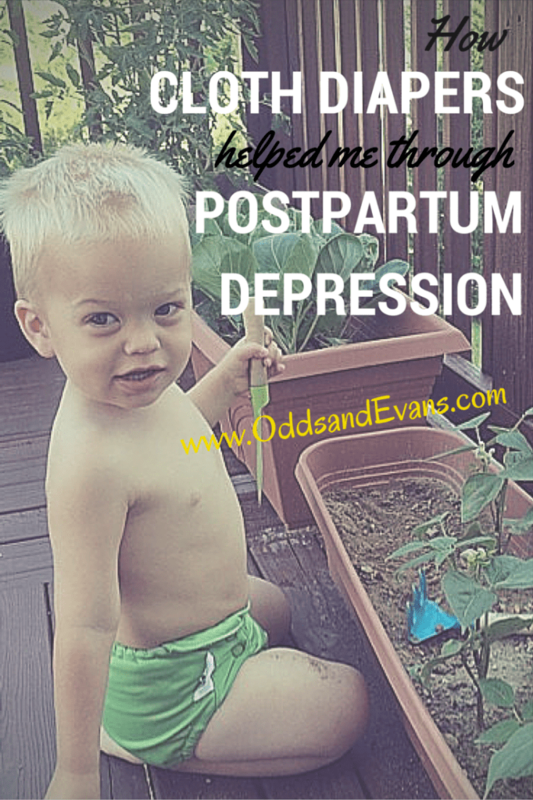 It may seem strange to say that CDing helped with my PPD (fully embracing the acronyms now). I didn’t realize it at the time, but using cloth diapers absolutely gave me a focus, confidence as a mother, and a closeness to my son as we grew together. It was a distraction that became a passion. Through postpartum depression, I scrambled. With cloth diapering, I found structure. In motherhood, I found myself. Eventually.